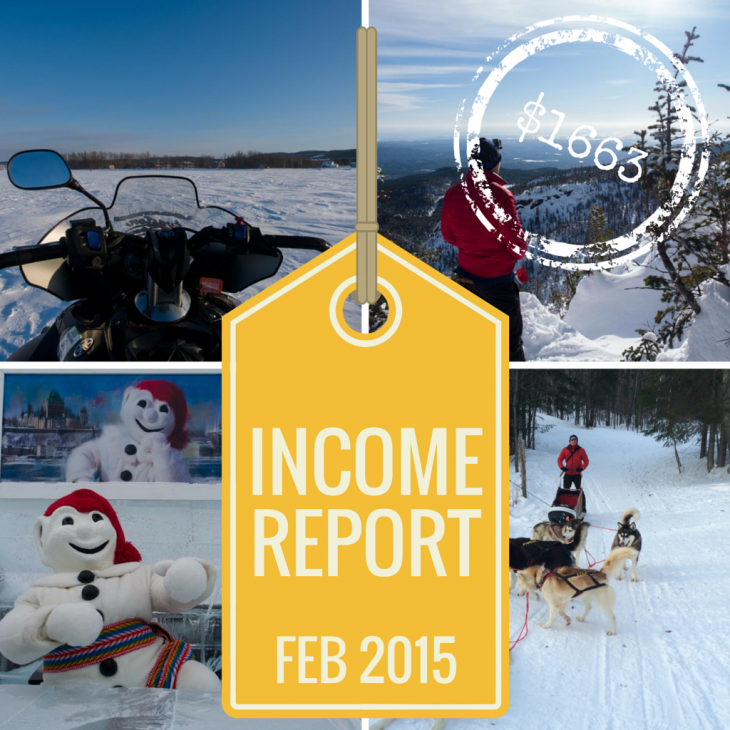 I’ll tee up this income report as my most successful month yet! A lot of things are starting to click so hopefully you guys’ll pick up on a few things to help with your own blog. As most of you know, I started doing these income reports back in October and I think out of everything on the site has been the most successful and insightful for readers. I really want to show you guys that it IS possible to make money blogging. The key is really to shift your mindset and start focusing on things that will drive in income as opposed to getting distracted with things that will waste your time and energy. For example, press trips and free travel is great and all but the problem is that most of these opportunities are not paying and will result in a LOT of work post trip. I had to turn down an awesome press trip to India in March because I knew it wouldn’t bring any income and would be 2 non productive weeks that I wanted to spend optimizing my blogs and completing other promised deliverables from my trip in February. Alright let’s dive straight into the income numbers for February. Income wise, I was quite pleased with February, doubling up on what I made in January. That being said, I need to be cautious because I know that a majority of that came from CopyPress and with no new opportunities in sight from them, I need to start looking elsewhere for new streams of income. Google why are you so puzzling. One month you do crappily and the next you bounce right back and bring in the most amount of dough I’ve seen yet. 10 more clicks resulted in almost $20 more in revenue this month. This may have been a result of the higher CPCs I was able to get in February. 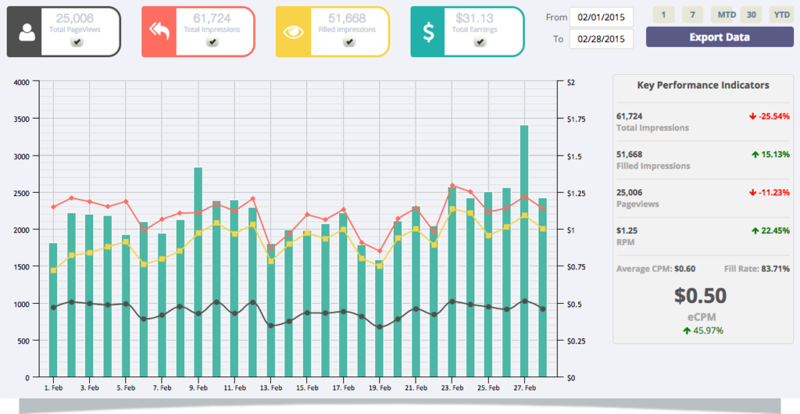 As a result Page RPM (revenue per thousand of impressions) also increased from $1.22 to $2.25. The curious part about all this was that my page views actually went down from 29,066 last month to 23,934. I’m starting to feel like results month to month are just completely random depending on who feels on clicking. This month, it becomes even clearer that the above article ads are simply crushing every other type of ad that I have set up. This just goes to show you that “in-article” ads do way better than sidebar ads. This has to be the result of something called banner blindness. People are so used to seeing ads on the side that they completely don’t even notice them as they’re going through an article. 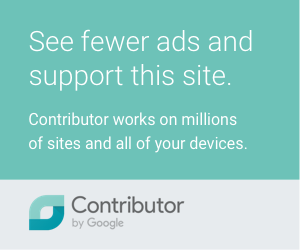 Footer and Below Article ads are more or less gone because I’ve switched them over to TBN. Looking at this, you see a big surprise. How the heck did Australia get up there? There must’ve been 9 awesome Australians that clicked on ads that had incredibly high CPCs to bring in $18.19. In previous months Australia typically came in 5th with marginal ad amounts. This month I looked at something different and that’s the ad types. As you look at the report, you will probably be as surprised as I was when I saw that text ads actually out performed any of the others. Sure they were displayed the most based on “Ad requests” but still…42 clicks vs 2-5 for the ads that include images. Mind blown. I wonder if this is the result of text ads looking like they blend in with the content? Although The Blogger Network (TBN) didn’t surpass Google AdSense this month, I was still happy with its performance and again the customer service. My account manager emails me almost weekly telling me things like “I raised the triggers in Openx and Sovrn to $1.40 and $1.00” or how he’s changed the triggers to be ad-size specific to optimize further. I really don’t have to do anything at all which I LOVE! 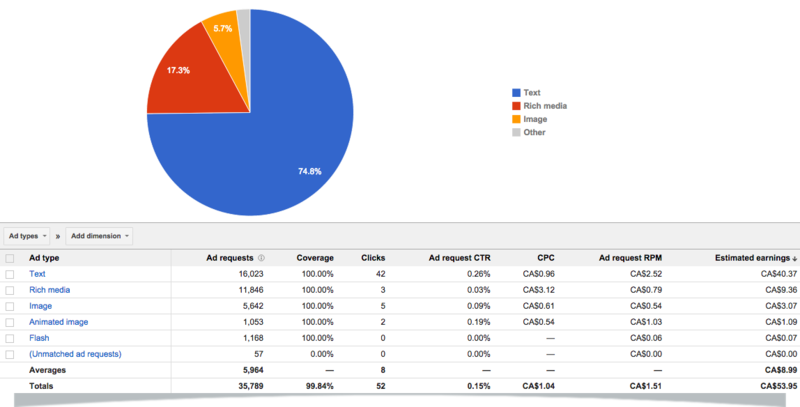 In-image ads were added this month to increase my eCPM. I love how these look! 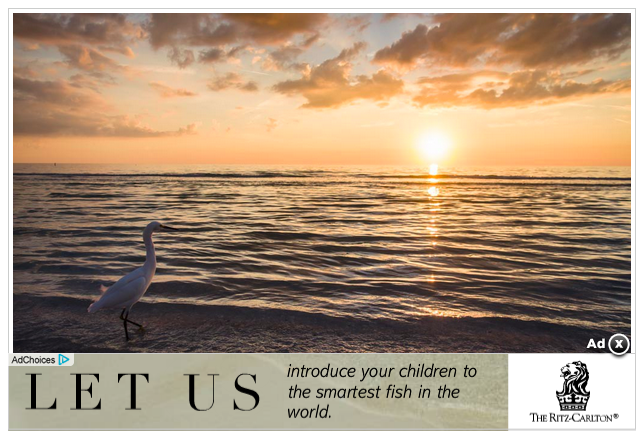 I’ve included a screenshot of a sample ad. It’s unobtrusive and is another great way of delivering ads. If you join and are looking for more ad juice, ask them about the in-image ads. Sample of an in-image ad with The Blogger Network. Spoutable cooled off this month after a hot start. The founder is still looking into how we can improve the performance of the on-exit ads and get them to display on all exits. It doesn’t seem to be firing all the time. Again I forgot to grab a screenshot on March 1 to be able to see the performance of the last 30 days. Hopefully I can get it for the March report. Looks like this has stabilized to $10/month which isn’t all that great. Seriously contemplating cutting them out and using that block for AdSense or TBN. Bluehost – While I didn’t really do anything different this month, I finally got my first referral. At $75 a referral, there’s huge money in this space. That is why you’ll see a lot more posts in the coming weeks about the different tiers of hosting and my migration to WP-Engine. themidgame – I’ve been a member of themidgame for a long time but have only had one gig with them. That all changed when they woke up from their slumber and started adding a slew of opportunities on their platform. The one that intrigued me the most was the Bluesmart suitcase. Wanting to use this as a testing ground for some of the things I learned at Affiliate Summit, I’ve been investing heavily in Facebook and Twitter advertisements. I started off organically with posts on Twitter and Facebook like I normally would. On Twitter I scheduled posts out for a good month. These are great because it’s free to promote on your own platforms. Seeing a lot of engagement on my post, I spent money on boosting it to my own Facebook followers and their friends. I learned that the digital scale resonated the most with people so I started focusing on that in my messaging. My daily budget was $2. 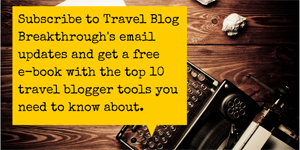 Thinking more strategically, I realized that I needed to get out of just the travel blogging niche so I started another boost campaign – One to Flyertalk fans and another all general frequent travellers. I had both running at the same time and found significantly more engagement with Flyertalk than I did with the more general frequent flyer group so turned the second one off. This is pretty much the general premise of A/B testing. Daily budget also set at $2. Wanted to play around with Twitter ads, I set them up last week and while not seeing a whole lot of click throughs, what I like about Twitter ads is that you’re only charged for actual click throughs. You don’t get charged for impressions which is great. For Twitter I also wanted to be highly targeted so I focused again on those that are business travellers. I’ve sold 3 suitcases at $30 a piece so far so it’s this has worked well so far. I’m starting to see the big potential here. Find a good affiliate offer to promote and there’s a lot of money to be made if you can tap into a big audience. Payments from CopyPress for the #HipmunkCityLove project are coming in fast and furious which is great. That being said, there haven’t been new freelance writing opportunities coming up so expect this to dry up in a month or two. While the income from freelance writing is great, you constantly have to look for more gigs to keep the money rolling in. The opportunities also don’t just present themselves either so you really have to look hard. I have some thoughts about this a little further down. Sponsored work has dried up these past few months but if it’s anything like how last year was, I know that opportunities are going to pop up. Continue working with Seeding Up on sponsored links. My profile is complete so if there are new companies that want to work with me, I’ll get an e-mail. Check themidgame periodically for new opportunities. Tap into those sponsorship lists but looking to stay out of that for now. If I go on this trip, how much extra work will this generate for me? Will this extra work generated I have to do for this bring in any income? Will the content created from the press be of interest to my readers? Is there a way to get paid a per diem on this press trip? Is it worth my time to pursue a comped stay or press trip when it’ll be a lot less headache and commitment to just plan it all myself? With all my press trips I took in January and February, I will say that I was also quite stressed after coming home from a trip. You’re always going to have a massive backlog of work after being gone a week. Taking a press trip also means you commit to writing X amount of posts for the brand or destination. For me, I always go above and beyond and make sure I do it in a timely manner which is probably a reason for my stress. For example, it’s taken me a good 3 weeks to get all of my video and blog posts done for Quebec. While the experience was awesome and the content that’s going to be coming out the next few weeks is going to be killer, at the same time I made $0 from it. I’m just saying. Here’s a look at my traffic numbers from February. February took a dip in traffic. I’d like to think a shortened month has something to do with it but this is another reminder for me to focus again on traffic building. I’ve kind of gotten into a groove with my posting schedule and social sharing but I really haven’t done the other things like commenting on other people’s blogs and writing more posts I know will rank high on Google. What I’d really like to do is crack that 1,000 sessions a day line. 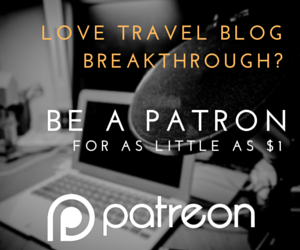 Travel Blog Breakthrough on the other hand saw a nice spike towards the end of the month. I’m not quite sure where it came from but I’m not complaining! All numbers took a dip this month. I blame the short month! One exception is Revive Old Post referrals. I purchased the Pro edition and I can see an increase in click throughs since now all of my auto tweets include photos AND I’ve been able to create a custom schedule for when the tweets get sent out. I’m still puzzled about Casual Traveller. I received 75 referrals from them but I don’t remember doing any guest posts on there. I did a search and found that she did put a link in there about Marriott Rewards Plus Points program I wrote way back. February was a busy month of catching up with work as a result of my Quebec press trip but I still managed to put a bunch of things in play to slowly improve things on both websites. The biggest breakthrough was definitely the taking advantage of affiliate offers like the one from themidgame to start building more passive income. Hoping to do more of this in March! Working it on FB, Twitter, Instagram, Pinterest etc. etc. Leave a comment if you feel me. I honestly don’t know how people are able to keep up especially those that are as engaged as they are on Facebook groups. TELL ME YOUR SECRET!! Do I really have to start thinking about getting a VA (virtual assistant)? PRIORITIZE – What I really wanted to say in this section is that you just have tackle one thing at a time. Prioritize and knock things off that list. For me, Quebec posts were a priority so that’s all I’ve been doing for the past 3 weeks. Have immediate deadlines the following week? Work on those! FB GROUPS ARE GOLD – Despite being a lurker most of the time, I will still check my favorite FB groups ever day or every other day to see what people are chatting about. It’s easy to get sucked into a lot of the noise going on there but there are always nuggets of gold in there. For example, just the other week I saw an open call out for freelance writers and another one mentioning a press trip that I ended up applying for the day after. If you don’t stay connected, you’re going to miss out on these opportunities. CREATE A PLAN – Whether you create a publishing calendar like I do or jot notes on a paper somewhere, it’s good to be able to figure out where you want your blog to head towards in the next 2-3 months. With these goals, you can then start thinking about what you need to do to accomplish them. From my personal experience, without a bigger goal (i.e. make more money), you end up floundering around the blogosphere and going with the motions. LOOK AROUND – There are opportunities all around you. You just have to go ask. For instance, I had a comped stay at Sirata Beach Resort when I did my press trip around St. Pete, Florida. I thanked them and could’ve left it at that but since I knew I’d be doing a hotel review for them, I approached them about hosting a giveaway. I pitched them the benefits and they were onboard. Look at your own network for opportunities that you may not have tapped into in the past. Bottom line is, like Mr. Scott Eddy says, travel bloggers are also entrepreneurs. We’re the ultimate hustlers. Scott Eddy’s podcast was a huge hit. If you want to know how to build your social media following, this is the one you gotta listen to. For a limited time, I’m offering the course for $5 to all of you super fans. 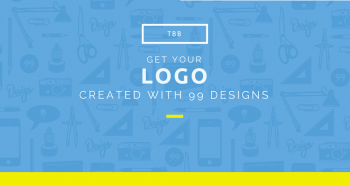 Use code TBBFEBINC. There are only 5 codes and it expires Mar 31, 2015. I‘m going to be laying low in March so hopefully I’ll get to doing the major revamping that has been on my to-do list this whole year. The more I play around with affiliates, the bigger the opportunity I see with them. You look at all the big bloggers out there and they’re leveraging their influence to push affiliate-linked products everywhere. Incorporate that into your blogging strategy and you could earn some good coin. I love press trips and all but damn it’s a lot of work. My one week press trip to Quebec resulted in 6 blog posts + 6 videos. I definitely over delivered here didn’t I? The Blogger Network continues to be simply awesome. You really gotta get in on this. There’s not enough time to do everything so do the little things that’ll get you the maximum return. Hey Anne, as usual I appreciate your comments 🙂 Hope things are well on your end! Interesting as always 🙂 I find it interesting that you have had luck with sites such as the Mid Game and IZEA. I have found them to be a big time waster. In my experience, it’s easier to get freelance work than muck around in them with most campaigns seemingly never picking anyone in IZEA. Sponsored travel is a hard one and one that I am constantly weighing up the cost vs benefit. Our situations are different as we are permanent nomads, and I have absolutely no interest in an organised press trip. However, sponsored accommodation and more expensive attractions do save us money and really effectively count as income. I work out how much money we save by doing a sponsored stay and work out if that hourly rate is worth the effort I put into the promotion, finding the hotel etc. It is a fine line. I often want to just bury myself in work and forget travelling all together but then I remember that I did this for a better lifestyle and for me, that definitely includes travel. I have been going better income wise since I concentrated on stuff that earns income directly. For me, this means being quite brutal with spending time on things like IZEA and Fb groups. One good opportunity may not be worth the time compared to the amount of ongoing money an affiliate post can make. I have found my income only really took off when I completely stopped thinking about traffic. The upside has been that since I did that, I also had my traffic increase 300%! Working on good on page SEO can have the advantages of both income and more hits, especially if targeting the right types of keywords. Platform wise, I haven’t received any opportunities yet this year but it’s the kind of thing you keep your finger on the pulse on because you never know when there might be a great sponsored opp. What I love about these platforms is that the campaigns are all completely legitimate and not shady at all compared to others. 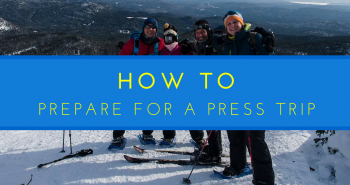 Organized press trips are interesting because they are a great way to make a good impression on a tourism board that may lead to opportunities future on. That’s how I treated my Quebec press trip. I made sure I impressed and hope to do future work with them. Individually organized trips are my preference as well as they give you the freedom to plan it the way you want but like you said, you do have to weigh in the time it takes to put it together vs just paying for it and not having that obligation over your shoulder to write a review or whatever it is. Yeah how do you guys do it with the FB groups?? Sharon you’re definitely way more engaged than I am. I often feel pretty bad. I love that your traffic has gone up even though you’ve stopped working on it. 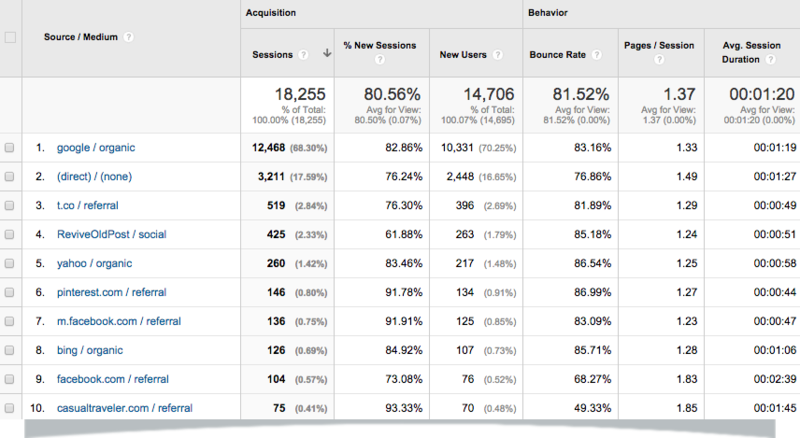 For me, I’ve actually stopped checking Google Analytics and that has helped me keep sane. It’s ironic how it works right. The less you think about it, the more it works out for you down the road. Yeah Yonderbound has definitely been super friendly to us bloggers. The income actually came from the one-off fee and participation in some of their beta experiments and not so much from commissions. I’ve been able to generate click throughs from my promotion but haven’t cashed out on any conversions yet. Great meeting you at Affiliate Summit (obviously I’m a big fan of affiliate marketing too) and find your income reports. Nice work doubling your income from last month! I’m intrigued that ReviveOldPosts plugin resulted in that much traffic. Looks like bloggers need to check that out. 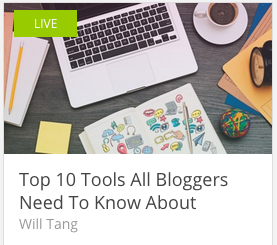 Thanks for the shout out to The Blogger Network! Hoping you’ll decide to give us that AdSense space next. Plus, our Flight product for your mobile traffic. Curious what % is mobile. Hey Janet! So awesome to have you on the site! It’s been a work in progress but have been very happy with how everyone’s received my content so far. ReviveOldPost has been great and has truly propelled my Twitter engagement and click throughs to be number 3 behind organic and direct. With the Pro version, it now tweets out the featured image as well so a majority of all my tweets are media rich which I love. Been following this every month! We also had a big income spike last month because of yonderbound and we just joined The Blogger Network! Keep them coming! Thanks for all the info! Hey Kach, thanks for stopping by! Great to hear you guys moving up as well. TBN is going to be a great experience I can guarantee that! I found your blog through matthew’s blog. It’s really interesting to see how you grow your blog, create more products and also podcast. I’m a fan of internet marketing and a little bit of blogging. Need to find time to write one blog post per week. Well, talk to you soon! Raweewan recently posted…My March 2015 Monthly Report: Kindle Publishing, Hiring VA, Coaching Experience and More! Hey Raweewan! Thanks for stopping by from Matt’s report! Likewise, it’s awesome to see what everyone else is up to. You guys are the real inspiration! !